CVS Health has been named 2018 National Corporation of the Year by the Greater New England Minority Supplier Development Council (GNEMSDC). 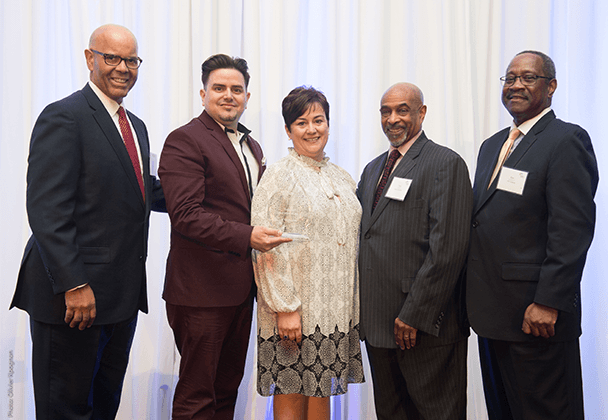 Raul Suarez-Rodriguez, CVS Health Manager of Supplier Diversity and Strategic Procurement, has also been named as GNEMSDC’s 2018 Advocate of the Year. Through our supplier diversity program, we partner with organizations across the country, like GNEMSDC, to help us identify and partner with a wide range of diverse suppliers, including minority-owned, women-owned, and veteran-owned businesses, as well as small businesses. CVS Health believes that a diverse supplier base is key to our ability to deliver innovative, high-quality products and services to customers and the communities we serve across the country. As Manager of Supplier Diversity and Strategic Procurement, Suarez-Rodriguez has spearheaded supplier diversity initiatives for CVS Health since 2012. In this role, he helps to recruit diverse suppliers and works with them to ensure a fruitful relationship with CVS Health. He was nominated for GNEMSDC 2018 Advocate of the Year by several businesses local to New England that he has worked with. For more on CVS Health’s commitment to supplier diversity and an overview of our program and upcoming events, please visit our Supplier Diversity Center at cvshealth.com/SupplierDiversity.